↑ "About World Aids Day". National Aids Trust. http://www.worldaidsday.org/about-world-aids-day.php। আহৰণ কৰা হৈছে: 4 December 2014. ↑ "Joint United Nations Programme on HIV/AIDS (UNAIDS), ''Report on the Global HIV/AIDS Epidemic 2008,'' (Geneva, Switzerland: UNAIDS, July 2008)". UNAIDS. http://www.unaids.org/en/KnowledgeCentre/HIVData/GlobalReport/2008/2008_Global_report.asp। আহৰণ কৰা হৈছে: 2013-12-05. 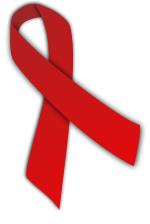 ↑ 7.0 7.1 "Inventors of World AIDS Day: James Bunn and Thomas Netter". http://www.newsworks.org/index.php/local//speak-easy/30571-inventors-of-world-aids-day-james-bunn-and-thomas-netter. ↑ 8.0 8.1 8.2 "Speicher, Sara. "World AIDS Day Marks 20th Anniversary Of Solidarity." ''Medical News Today.'' 19 November 2008". Medicalnewstoday.com. http://www.medicalnewstoday.com/articles/130044.php। আহৰণ কৰা হৈছে: 2013-12-05. ↑ 9.0 9.1 "van Soest, Marcel. "Accountability: Main Message on World AIDS Day." Joint United Nations Programme on HIV/AIDS. 20 Oct 2006". Unaids.org. 2006-10-20. http://www.unaids.org/en/KnowledgeCentre/Resources/FeatureStories/archive/2006/20061020_Interview_Marcel_van_Soest.asp। আহৰণ কৰা হৈছে: 2013-12-05.